We're offering savings on multi-bottle packages. This allows us to save on the cost of processing each order individually, savings that we pass on to you. All orders are one-time purchases. We will not auto-bill your credit card. VitaPulse is backed by a 90-day Money-Back Guarantee. If you don't experience an immediate difference in your body, send back your bottle for a full refund - no questions asked. Dr. Bereliani is a fellow of the American College of Cardiology and an active member of the American Heart Association, the American Medical Association, ASNC the American Society of Nuclear Cardiology (ASNC), the Society of Nuclear Medicine (SNM), the American Academy of Anti-Aging Medicine (A4M) and the American College for Advancement in Medicine (ACAM). Through our partnership with Pencils of Promise, a portion of every sale goes towards making education available for more children. Our first goal is to build a new school by July. Your order will help Pencils of Promise fulfill their mission of providing children with access to quality education. The average order for new customers is 3 bottles and that’s what we recommend to start. However, because we have many repeat customers, we offer the 6 bottle package so you can take advantage of our best pricing. Q: Will I be billed automatically? You order will be processed as a one-time charge. When you're ready to re-order, you can come back to this page, visit our website at PrincetonNutrients.com or call our customer service number. 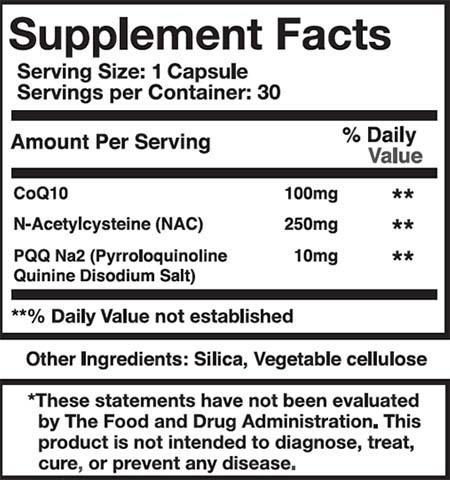 VitaPulse contains 3 key ingredients: NAC, PQQ, and CoQ10. Q: How should I take VitaPulse? The recommended dosage is 1 capsule a day. To help you stay consistent, we recommend making it a habit of taking VitaPulse first thing in the morning. It is okay to take on an empty stomach. Our capsules are small and very easy to swallow. Q: How do I know it will work for me? 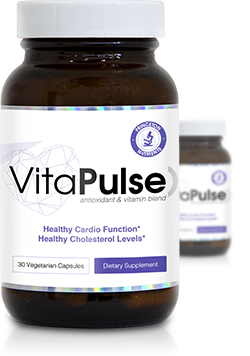 While we cannot guarantee that VitaPulse will work for everybody, we receive emails and phone calls everyday from customers who are excited about the results they are feeling in their bodies. In the unlikely event that you are not satisfied for any reason, you're covered by our 90-day, no-questions-asked, money-back guarantee. Princeton Nutrients implements a variety of security measures to maintain the safety of your personal information. When you place an order or access your personal information, everything goes through a secure server. All of your personal information, including credit card number, name, and address, is transmitted via Secure Socket Layer (SSL) technology — the industry standard for secure online transactions. © Copyright Princeton Nutrients, LLC . All Rights Reserved. These statements have not been evaluated by the Food and Drug Administration. The products and services found on this website are not intended to diagnose, treat, cure, or prevent any disease of any kind. These products and service are not intended for this with pre-existing medical conditions. Please use only as directed. Consult with you Physician if any of these products are right for you before beginning any prescription drug. Consult your Pediatrician before giving any of these products to a child under 18 years of age. Free shipping on selected items.